If you look forward to a play by Daniel MacIvor because of the pitch black, mind-twisting monologues he used to write like Here Lies Henry (1995), Monster (1998), or Cul-de-Sac (2002), you will be shocked by how mainstream his latest play Bingo! is. In his Notes in the programme, MacIvor explains that he wrote the play for his brother who recently retired from driving heavy machinery and lives in a trailer park in Sydney, Nova Scotia: “I wanted to write a play for my brother. I wanted to write a play that he would love and think was hilarious, that he would tell his buddies and their wives to go to see and be proud to say his brother wrote it”. That’s an admirable and understandable goal, but it does mean that MacIvor has written Bingo! with an audience in mind that is entirely different from his usual audience. In so doing, MacIvor has written a comedy that is much fluffier and more superficial than it needs to be. 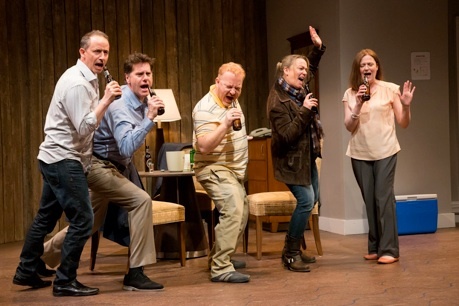 The play is based on the already well-worn premise of friends gathering at their high school reunion, in this case the 30th anniversary of their graduation from a high school in Cape Breton, Nova Scotia. Since the play premiered in Nova Scotia in 2011, the characters would have graduated in 1981. The action is divided into five sections, each prefaced by a monologue by one of the five characters. Contrary to what one might expect, MacIvor does not use these monologues to give us private insight into the characters, but rather uses them as a kind of chorus of nostalgia for things that used to be common in the 1980s – appliances built to last, playing cops and robbers outdoors, running inside to get the phone – that have now either stopped happening or been forgotten. MacIvor’s five characters have to varying degrees adjusted to the changing times. Up in a hotel room, the two most keen on reliving the past are the former school jock Doug “Dookie” Duke (David Keeley) and his slightly dim hanger-on Jeff “Heffer” MacInnis (Dov Mickelson). After the initial monologue by Paul “Nurk” Kenney (John Beale), Dookie and Heffer begin the action by playing their favourite drinking game “Bingo!”. The object of the game is to down a shot of vodka and punch each other in the stomach until one of the players has to throw up. That is the “Bingo!” of the game and of the title. The one who throws up is the “winner” because he can now drink more. When they involve Nurk, he reaches “Bingo!” early on because he isn’t used to drinking anymore. Once the nerd of the group, Nurk now has the highest-profile job of the five as an environmental engineer. He is also the one who is the least stuck in the past. MacIvor next introduces us to his two female characters, Kathy “Bitsy” Cameron (Sarah Dodd) and Laura “Boots” Boutlier (Jane Spidell). They are down in the club where nothing is happening. Everyone assumes the mail-carrier Boots is a lesbian because she never married. She says the truth is she never found anyone smart enough for her. She bosses the meek Bitsy around, who not only has never married or left town, but who never actually graduated from high school. She’s afraid someone will find out, when, in fact, everybody already knows and doesn’t care. One by one the depressing notion behind the lyrics hits them and they sink down into their seats. If there were more well-observed moments like this, the play might rise out of the tired genre of the reunion play. Yet, even in terms of plot there are odd omissions. We hear several times that Nurk’s wife left him, but MacIvor never gives us an explanation except Nurk’s statement “It was complicated”. Indeed, we wonder why Nurk has bothered to fly all the way from Calgary for the reunion since he doesn’t seem to care much for any of his classmates. MacIvor concludes the action with a cute happy ending, but it has been so meagrely prepared it is hardly satisfying. But then, what can you do when a play deliberately sets out to demonstrate the truth of the Synanon axiom, “Today is the first day of the rest of your life”. The cast do well with what they are given, but the script is a waste of their talents. The characters are mere stereotypes – the jock, the hanger-on, the nerd, the tomboy, the wallflower. For a play about a high school reunion, we learn next to nothing about what the characters, except for Bitsy, thought of the experience. MacIvor makes the assumption that it was the greatest time of their lives, but it would help if he provided some evidence. All he gives us are replays of the “Bingo!” game, which are not exactly eloquent. Director Nigel Shawn Williams keeps the show going at a fast clip, which is just as well since there is nothing to ponder. The mixture of 1980s nostalgia, drinking and throwing up may be what MacIvor thinks will amuse his brother and his pals, but MacIvor is surely clever enough to devise a play that would please his brother on one level while appealing to those looking for something deeper on another. After all, the ability to appeal to both the groundlings and the courtiers at the same time is what gave Elizabethan theatre such scope and such success. Photos: (from top) poster for Bingo! ; John Beale, David Keeley, Dov Mickelsen, Jane Spidell and Sarah Dodd. ©2014 Joanna Akyol.